Aqua Map has added a premium tier called Aqua Map Master that adds AIS overlays, data via NMEA-0183 and SignalK over WiFi, US Army Corp of Engineers survey data overlayed over charts and a new route explorer. 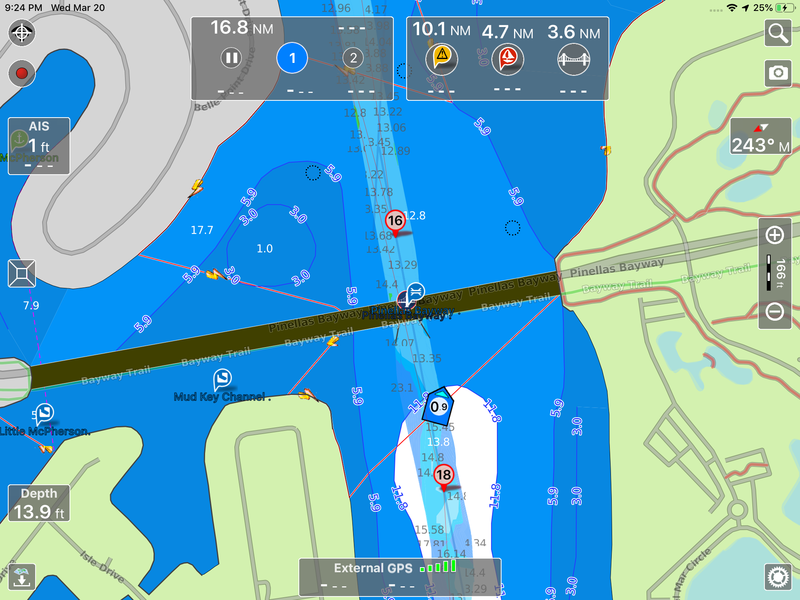 With Master, Aqua Map adds several features I haven’t seen on any other mobile app that I’m excited to try out. 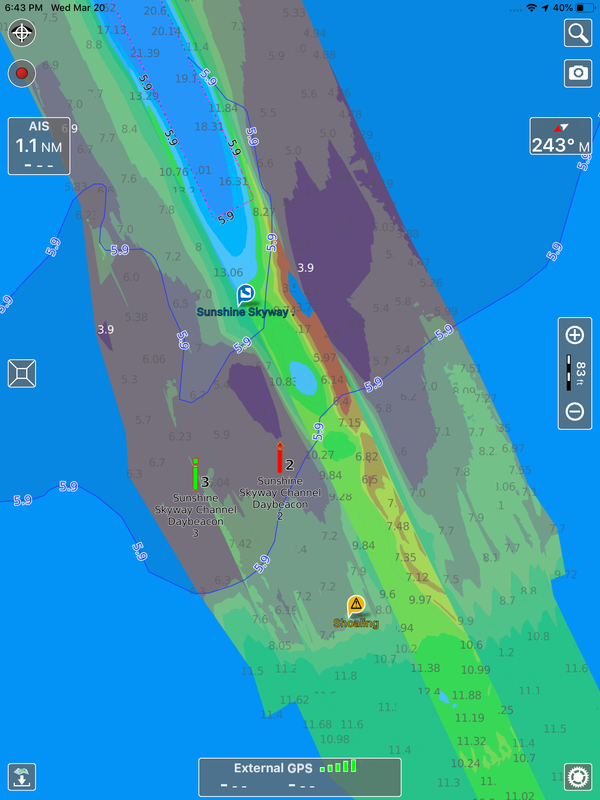 Aqua Map Master is a $10 per year subscription that Aqua Map says will get all their new premium features. 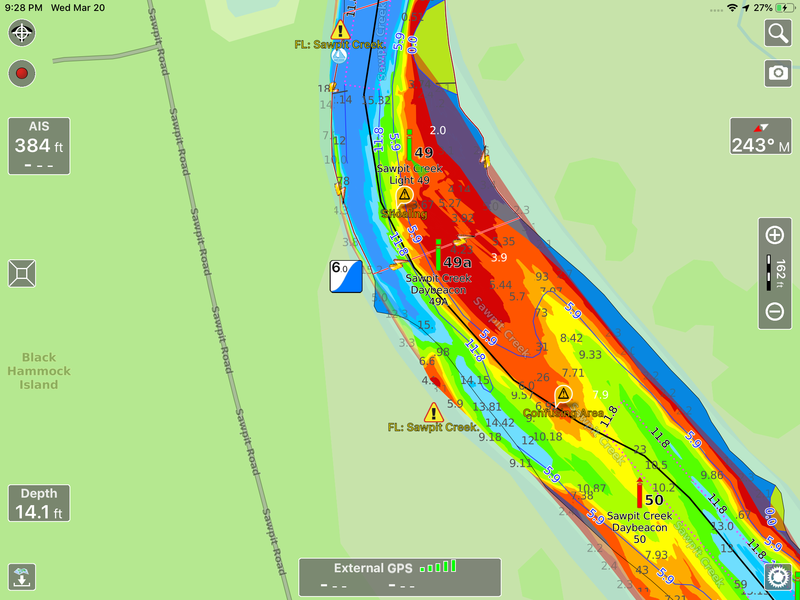 Aqua Map already has a nice suite of features including support for both Waterway Guide and Active Captain Community crowdsourced data, a great anchor alarm, strong data sharing, and now a new suite of premium features. 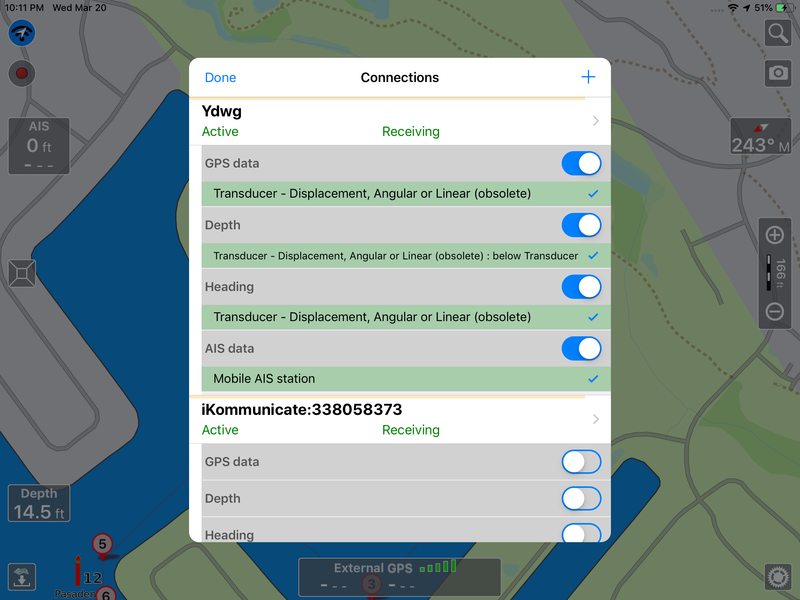 Aqua Map now supports receiving data from GPS, heading sensors, depth instruments, AIS receivers, and wind instruments via WiFi. Aqua Map can receive either NMEA-0183 formatted messages via TCP or UDP or SignalK messages. I have a Digital Yacht iKommunicate and a Yacht Devices YDWG-02 WiFi gateway onboard that are both compatible. 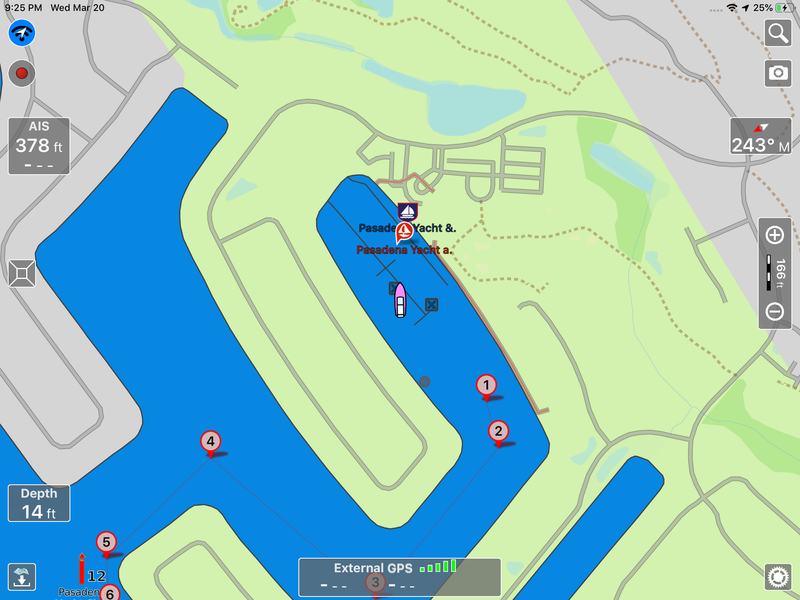 Aqua Map automatically discovered the iKommunicate while I had to manually add the Yacht Devices gateway. Once connected Aqua Map notifies you that you will be disabling internal GPS within the app until you turn off the external data source and changes the GPS status box text at the bottom of the screen to show external GPS in use. 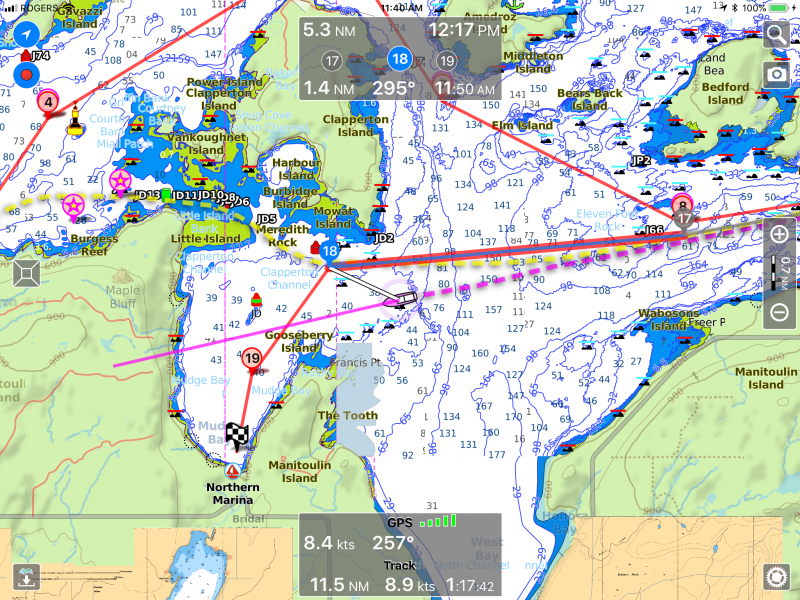 Aqua Map displays AIS targets from an onboard AIS receiver connected to your mobile device via WiFi. iNavX (and several other mobile apps) offers the ability to display AIS data either from an onboard AIS receiver or from an internet AIS aggregator where AIS data is downloaded via an internet connection and then displayed on the screen. Each method comes with some advantages and disadvantages. 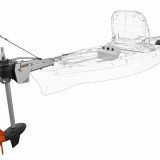 Aqua Map’s use of an onboard AIS receiver means you will get real-time data for boats around you as long as you have a receiver onboard. 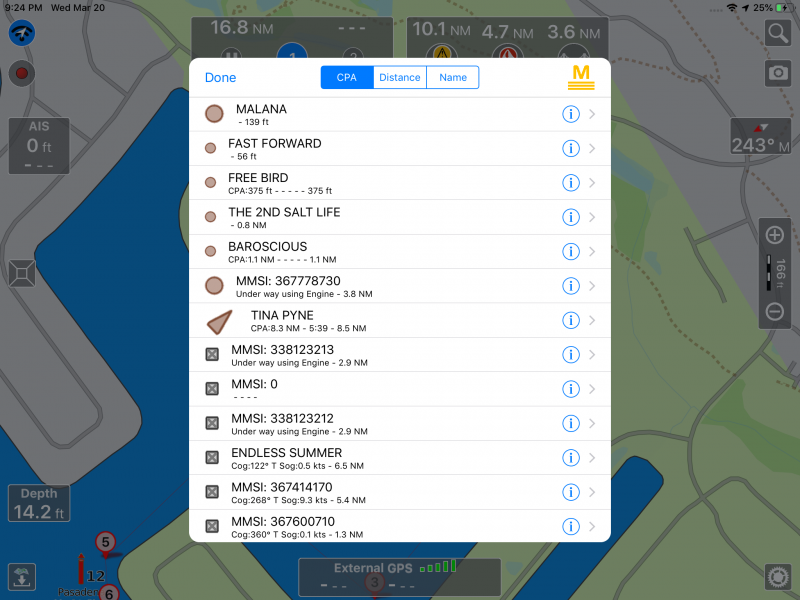 Apps that use an aggregator will work even if there’s not an AIS receiver on your boat but the data will be delayed and is reliant on volunteer receiving stations near your boat to receive and relay AIS information to the aggregator. I’ve already used the U.S. Army Corps of Engineers’ surveys while planning my upcoming travels and will soon use them underway. I’m pretty excited to have 40,000+ surveys overlayed over navigational charts. I’ve used USACE surveys quite a few times to negotiate tricky areas but now having those surveys available at my fingertips without navigating all the USACE district sites is a big improvement. Some of the more troublesome areas are surveyed by the Corps on a very regular basis so overlaying these surveys can mean having access to highly detailed depth data that is only days or weeks old. The transparency of survey colors is displayed based upon their age so that the most recent surveys have bright, vivid colors as in the screenshot above, while older surveys are much more muted colors. I have seen some places where it appears the surveys might not be properly georeferenced to the charts, but I don’t know with certainty that it’s an issue nor if that’s a limitation of the surveys or Aqua Map. Route explorer lets you see what’s coming up along your route. In the picture above the right rectangle at the top gives you information on what’s coming up on your route. In 10.1nm there’s an Active Captain Community hazard, in 4.7nm there’s a Marina and in 3.6nm a bridge. 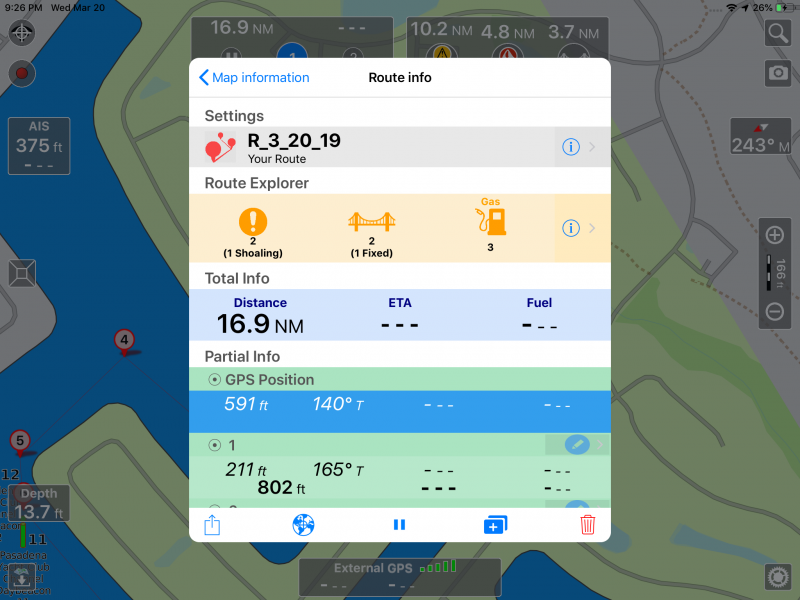 Route explorer lets you know at a glance what’s coming up, plus, if you click on any of the three icons it will center the map on the next hazard, marina or bridge. Route explorer also adds a section to the Route info summary letting you know what’s coming up on your trip, including fuel stops. 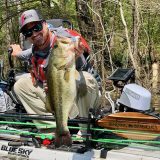 For $10 per year, Aqua Map Master is a lot of great functionality and strikes me as an easy decision for anyone who uses Aqua Map. 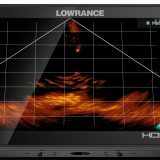 The additional features make an already strong option even more useful. NOAA erases the Magenta Line, will crowdsourcing step up? If you’re not seeing the Master options in your settings make sure you’ve upgraded to version 12. Also, only the iOS version currently has all the features mentioned. The Android version has the USACE surveys and the other features are being implemented now. Regarding the USACE Surveys georeference “issues” we have seen just few of them in the Jacksonville district along the ICW dredged channel, but there is a 2005 survey only. We do not perform any georeferencing, we get the survey already georeferenced by the USACE. It may be possible the canal 14 years ago was dredged parallel (100ft shifted) to the current one. If you have seen this problem in other places please let us know and we will contact USACE. Here’s an example where I’m unsure what’s correct and what’s incorrect. This is in Tampa Bay at about 27.636, -82.674 and there’s what appears to be a surveyed channel immediately east of G3 and R2. The surveys are about 5 years old here so not very recent. I see, even if it does not look a georeferencing problem, as you can see on top of your screen shot there is a dredged area that perfectly matches the survey. Also you can see that the ActiveCaptain shoaling probably at that time was north of the red buoy. It would be great having a newer survey here. That is the reason why we fade the older surveys for safety. Based on what you see here how would you navigate this area? Would you ignore the navaids and stay to the east and north of R2? That looks to me like the best path but as you say, these are older surveys. I would follow the nautical chart that should be more up to date…but we know sometimes it is not. Maybe better to use also your eyes and look if the buoys are in the charted position and follow what you see. If you’re a Ditch Driver, THIS is THE Ticket! And lots of thanks to Bob Sherer (Bob423) for his hard work with suggestions and Bate testing! Maybe a simple question: “Why no cooperation with NMEA2000K?” Not sure if I phrased that correctly but, other than putting a translator/adaptor in line for the 0183 and SignalK messages to get to 2000K – I’m guessing there is no 2000K offering (or maybe I’m not looking in the right areas) . . . . will there be one upcoming? Currently we developed the interface with NMEA0183 to support the wider possible range of devices and SignalK for what could be the future. We could evaluate the development of the NMEA2000 interface but for the moment this is not in out plans. Its also important to note that the NMEA-0183 format being used is only the data exchange format. This can get a little confusing but NMEA-2000 data can be carried over NMEA-0183 formatted packets and that data can come from NMEA-2000 devices. So on my boat I’m using a NMEA-2000 to WiFi converter. That converter is outputting NMEA-2000 sourced data in the NMEA-0183 format over TCP. Confused? The format versus data source distinction can definitely can give rise to confusion. The new AQUAMAP Master application is a nice upgrade. I particularly find the USACOE overlays the best feature. However I am using on Samsung 9 Android phone. The marker numbers will not show up in the “standard” map view and only on the most zoomed level on the “colorful” view- so it has limited the functionality of the app. I have sent an email with issue but just got back suggestion on how to use setting which did not address the problem. Hopefully an update will fix the problem. Has another else had these issues on android phone? I have Master running on an Ipad and get the signal through a Rosepoint NEMO box. It took a bit of networking advice from Rosepoint but it is working well now. PaulGel, would you mind sharing a bit more information about what you were trying to accomplish with Rose Point and how you did it. I am user of both Rose Point and Aqua Map. I am trying to figure out how to share data between the two so I cab improve overall functionality. Data format NMEA, Wifi Protocol UDP, Port No 10110. Every now and then you have to turn NMEA Checksum off to get the traffic flow started. I haven’t bothered AM about this issue yet.